I can't believe that the last time I posted was in November. Did you miss me? The year seems to be going so quickly, and already the tenmoregirls exhibition has come around again. 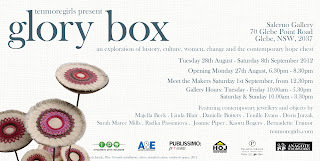 This year the exhibition is called Glory Box, each member of the group has reflected on the tradition of dowries or hope chests, and explored their personal responses in the form of contemporary jewellery and objects. I'm overjoyed with the show this year. I think we've created an amazing collection of work and the exhibition opens in a little over two weeks. My work started out a little bit bleak and teary, but I managed to find some positives through it all. My connection with glory boxes came from items from the dowries of my mum and my nonna: beautiful, hand made linens, embroidered with care. For me, they came to represent mothers and daughters together, preparing their glory boxes and preparing for different stages of life. The glory box holds the knowledge passed from mother to daughter, the maternal guidance for maturity, marriage and motherhood. 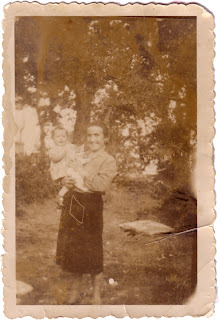 Sadly, both of the amazing women who raised me have passed away, and their absence is constantly felt. During my design process I wallowed in this for a while, feeling terribly small and alone in the world. I probably should have realised sooner that I am all the better for having known them at all, with knowledge and strength from when they were with me. My work became about holding, carrying and giving. I've made a series of vessels based on la conca, a traditional water carrier from the Italian region of Abruzzo. The area where my mother grew up didn't have running water, and the women used to fetch water from a spring or the well, carrying it home in the conca, balanced on their heads. The series of work is a celebration of wonderful Abruzzese women who are forever a part of my life. 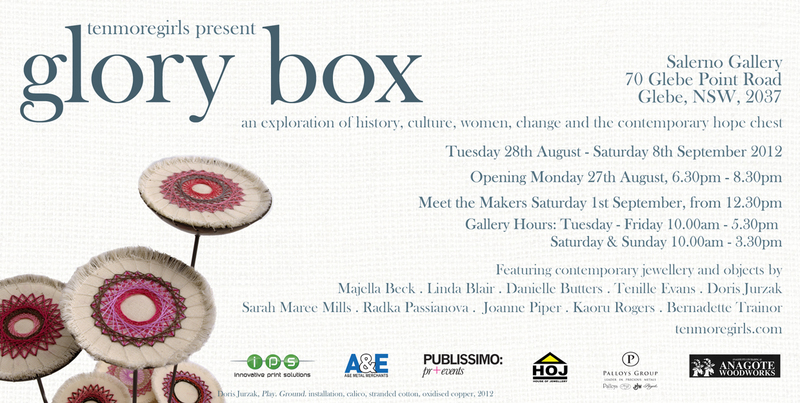 Tenmoregirls present Glory Box, opening Monday 27th August, 6.30 - 8.30pm. Hope you can come along and see the show! I'm not usually one to invite the internet into my bedroom, but I've been spending some time on Etsy recently, and I'd like to show you one of my finds. Utilitarian Franchise is based in San Fransisco, and you can buy their work here. anxiety #437 - how soon is too soon? Anyway, this is the first year that I get to decorate my own tree. Stan & I went out and chopped one down...not really, why would anyone want a dead tree dropping pine needles all over their beautifully furnished apartment? We got a fake one and it's pretty nice for a fake tree; it's taller than I am and while it'll never look that real, it's real-looking enough. Is it too soon to put it up? I never thought about it before, but apparently there isn't a set time to decorate your Christmas tree. I don't remember when we used to put it up when I was little. I've read that in America it's okay to put up the tree the day after Thanksgiving, but that doesn't really help. Even though decorations have been out in shops for a while, any time in November seems too early. To be honest I wanted to put it up the day we got it, but I don't want people to think I'm one of THOSE Christmas People. We all know one. They're a little too full of Christmas cheer, spending far too much on decorations, usually own some Christmas themed, sparkly jewellery and maybe a funny t-shirt or two? It's getting closer, and I'm placating my urge to yule by buying decorations. Our box of Christmas is constantly being swapped with a bigger box, my biggest extravagance so far being some vintage West German mercury glass drops, in a lovely aqua blue. I feel like I have to wait until it's well into December, or I'm a "Santa stop here" nightie away from living the dream. I know, I'm sorry, it's been ages, and worse than that, I left my last post about the tenmoregirls exhibition promising closure to the nail-biting, edge-of-your-seat "what's bernadette going to make" question. The thing is, back then I had a great idea of what I was going to make, but then I changed my mind. And then I got discouraged. Sometimes over-ambition can be my enemy, because I think I'm on to a winner, but the ideas become over-blown and convoluted. Originally I decided that I wanted to try to cook recipes I hadn't tried before, and make a piece that reflected each dish. To finally conclude the last post...it was a lamb roast. I had never made one before. I think because it's the sort of meal reserved for Sundays and Easter I assumed it would be difficult. Imagine my delight when I found you just stick in some garlic and rosemary, put the whole thing in the oven, and that's it. It's a vessel and a pin, and meant to be like a little nest, warm and cosy, like that feeling you get at home. 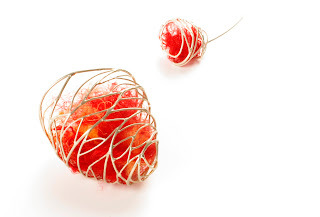 I continued cooking, and tried to design interpretations of dishes, but I wasn't happy with the outcomes, nothing worked together as a cohesive body of work. It just looked messy. I was cooking things like tagines, hot pots, soups; slowly it dawned on me that I was drawn to making comfort foods. They all had that warm, cosy feeling. It was one of those lightbulb moments, my work became focussed on the idea of the home, the warmth of the hearth. So I've been making a series of silver nests, holding silk, cast glass and pate de verre glass, representing comfort, stability and protection. They're nearly finished, which is lucky, as we're installing the exhibition in 2 days time. The other reason I haven't been posting is that I've been pretty busy on the home front. Stanwell, my resident mixologist, and I have packed up the tikis and moved. We are Marrickvillains no more (the best I can come up with now is Dulwich Hillbillies?) Anyway, all the pottering and tinkering around the new place does seem to take up a lot of time, but it's looking pretty spectacular. I'll post some pictures soon, I promise. Salerno Gallery, 70 Glebe Point Rd, Glebe. The show looks amazing! Congratulations Christina, you did a fantastic job, and congratulations to all the artists. The eggs look spectacular. If you didn't get a chance to come to the opening, the eggs will be up for a couple more weeks, and the food and drinks at Petty Cash are great, so drop in and check it out! My set, The Feathered Nest, inspired by 1950s decorative arts, atomic ranch houses, and everything inside them. Christina Adamson is curating another exhibition at Petty Cash Cafe. 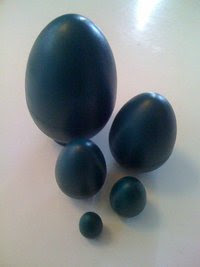 Artists have received a set of 5 nesting eggs to decorate. Nest Eggs is opening this Tuesday night, from 6 - 8pm. 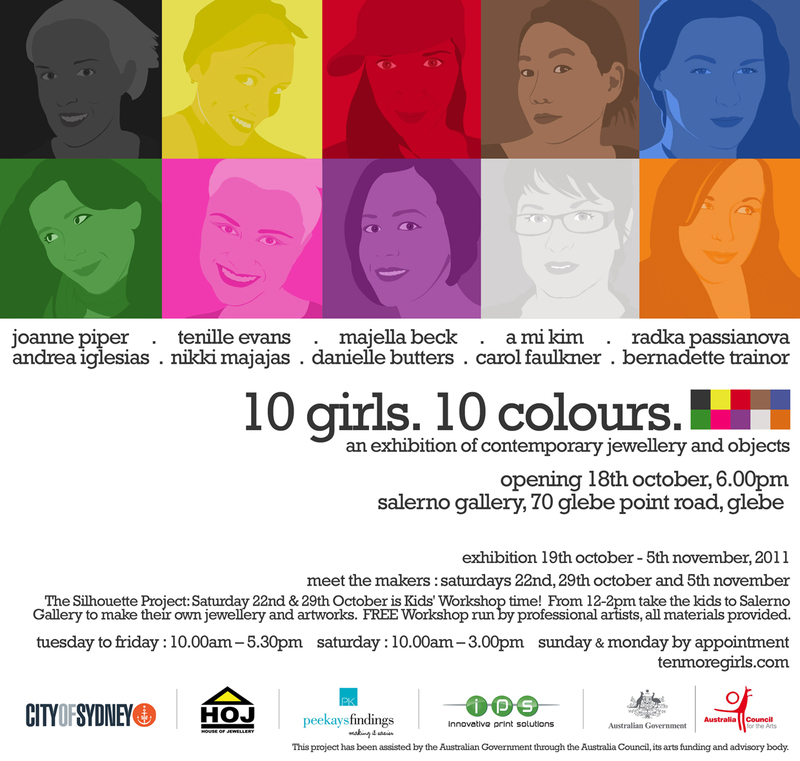 So it's all systems go for another tenmoregirls exhibition, 10 girls 10 colours. This year we each drew one of 10 colours, looking at our personal response to our colour. What does it represent? How does it make people feel? My colour is orange. Orange runs a close second to red, as a favourite colour in our house. My first thoughts ran to the kitchen, home to 1970s orange handled utensils, vintage Pyrex and linen. Then they turned to cooking. A warm colour, orange stimulates the appetite. I thought of spice markets, towering pyramids of ground spices, with heady, exotic fragrances. My searches returned images of spices, but in amongst them, pictures of food. There were thick curry sauces, tagines, spicy soups; I found myself not so much inspired to make jewellery, as inspired to start cooking. I've always been a defeatist in the kitchen, daunted by recipes with too many ingredients, or what I thought to be tricky cooking methods. I could talk myself out of trying new things pretty easily. Recently though, I've been breaking down my self imposed barriers, finding that just following a recipe can bring surprisingly delicious results, and a little confidence can inspire creativity. And so for 10 girls 10 colours, I'm going to spend some time in the kitchen. I'm planning a series of wearable pieces, inspired by the things I'm learning to cook. Stay tuned, first thing on the menu is a family favourite.